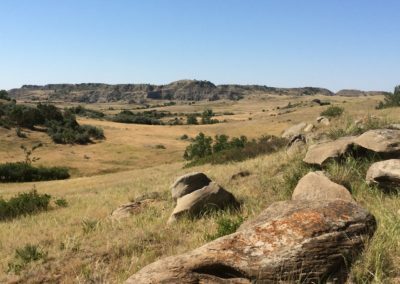 Our range is a land of rollings plains, tablelands, buttes, canyons and badlands in the Little Missouri River watershed. 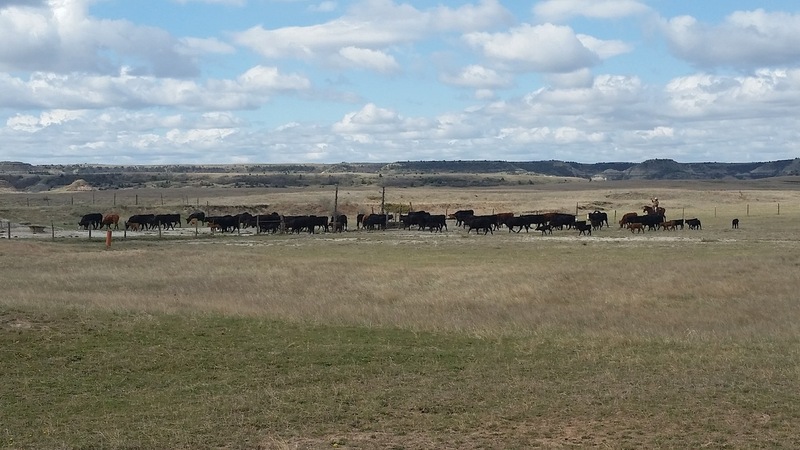 We are located just south of Medora, North Dakota at the end of the historic Great Western Cattle Trail, the last and longest of the 19th century cattle trails from San Antonio, Texas. The story of our range is one of 4,500 years of silence, dotted by occasional wildfire, blizzards and thunderstorms that began when the post-glacial climate warmed and stabilized. The prairie became dominant and the Little Missouri River began cutting and eroding much of the Badlands views you see in the region. Even today, serenity prevails over most of our ranch and grazing lands. It is so quiet you can hear the rustle of two stems of grass against each other in the breeze over 50 feet away. Only three main roads traverse the 17,000 acres we have in our domain for our cattle to graze upon. Our prairies have little bluestem, side oats, grama grass, western wheatgrass, needle-and-thread, buffalo grass and Junegrass. The blooms of blazing star, Mariposa lily, penstemon, prairie clover, golden pea, globe mallow, yucca and coneflowers grace the landscape while winterfat, rabbitbrush, sagebrush and winter snowberry are common low shrubs. 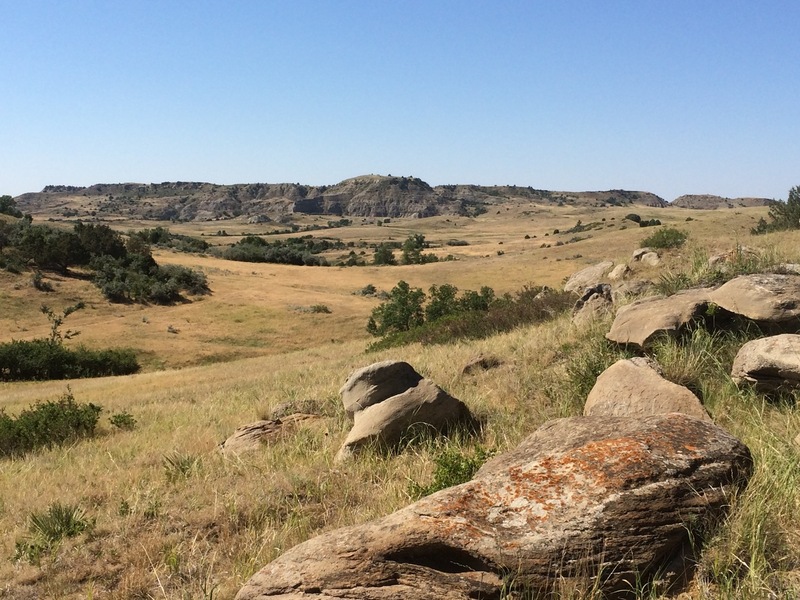 We feel the prairie, not the spectacular badlands, are the centerpiece of our range and its most important feature. 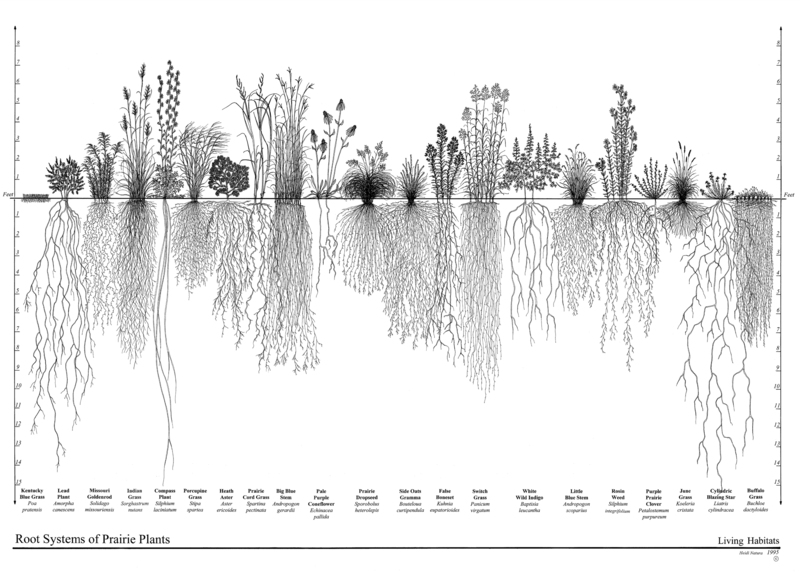 The deep roots of the prairie plants, some penetrating 12 feet or more, store organic carbon so important for our climate and soil health. The deep roots also provide pathways for water to infiltrate to the water table during the cool seasons. This infiltration supports the water table that feeds our creeks, rivers, ponds and reservoirs throughout the region. Between badland buttes and the wide, rolling plains are many narrow canyons and sheltered slopes. These harbor western red cedar, chokecherry, serviceberry, ash, willow, elm and western cottonwood. Narrow marshes and wet meadows occur in some of the deepest defiles. The streams, ponds and small reservoirs in these places provide shade and refuge for our cattle and wildlife alike. Dantz Creek, Merrifield Creek and Davis Creek are the main tributaries of the Little Missouri River that water our range. Just a few decades before Sylvane Ferris and Bill Merrifield ran the neighboring Maltese Cross ranch for Theodore Roosevelt in our neighborhood, large herds of buffalo migrated with the seasons across our lands. Now mule deer and pronghorn antelope thrive on the plains and in the canyons. Cottontails, jackrabbits, badgers, coyotes, skunks, prairie dogs and ground squirrels are abundant and sage and sharptail grouse are often flushed from cover. As our name suggests, we’re most proud of the many grassland-nesting birds throughout our prairies. Besides the western meadowlark, at least 10 other species are commonly sighted, including the horned lark, lark bunting, Baird’s sparrow, grasshopper sparrow, dickcissel and chestnut-collared longspur. Many of these are double-brooded in years of good rainfall, when 12 to 14 inches of rain can be expected, much of it from May through August when fledgling grassland birds most need a productive prairie with many seeds and insects. 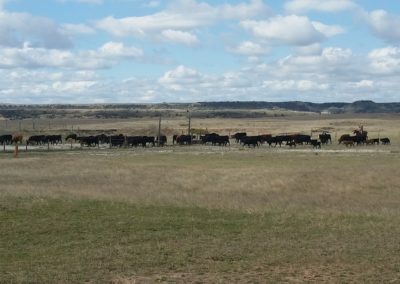 To further encourage our feathered wildlife, we move cattle continuously through the spring and fall into different fenced portions of the range to maintain a light grazing pressure. In the winter, we move cattle to private areas of the ranch surrounding Tracy Mountain and the Moody Plateau, where we conserve grasslands for this purpose that are surrounded by forested canyons and water sources to provide the best cold weather shelter. 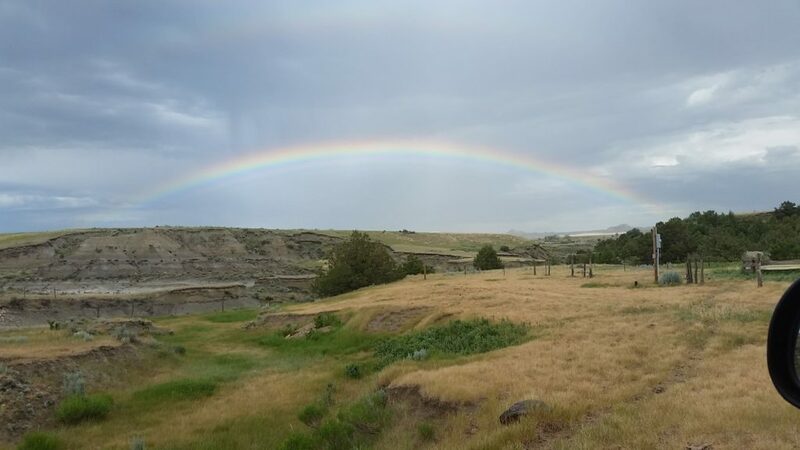 If you plan to visit our ranch, the best time of year is April through June. During this time, several calling meadowlarks at a time can be heard over many parts of our range. It’s a special time, in a remarkable landscape and would be made all the more special by your visit! The sweetness of the Meadowlark’s song can be tasted in our beef. We recommend that for maximum flavor you cook our beef “bone in,” over natural hardwood charcoal instead of pressed briquets or gas. A succulent T-bone or ribeye steak cooked rare to medium rare has an exquisite flavor near the bone that is past belief. Try some today and you’ll savor not only the best beef you have ever tasted — but also the heritage of our range is cooked in, along with its time-honored western cowboy traditions. But be warned: you’ll be spoiled. You’ll never again settle for anything less than Meadowlark Beef! The Western Meadowlark is a grassland-nesting bird known from every prairie state west of the Mississippi River.It is one of many grassland nesting birds like the Bobolink, Lark Bunting and many sparrows that breed in great numbers across our range every spring. They are an annual measure of our successful grazing practices and the enduring health of the prairie. We take great pride in being able to carry an authentic American ranching tradition into a new century with our avian partners that give us such pleasure with their bright songs as we work afield. In a time when old ways quietly disappear under pressures of changing economies, shrinking families and the growth of “big business” models, we are able to offer you a premium product raised the way our grandfathers did it.